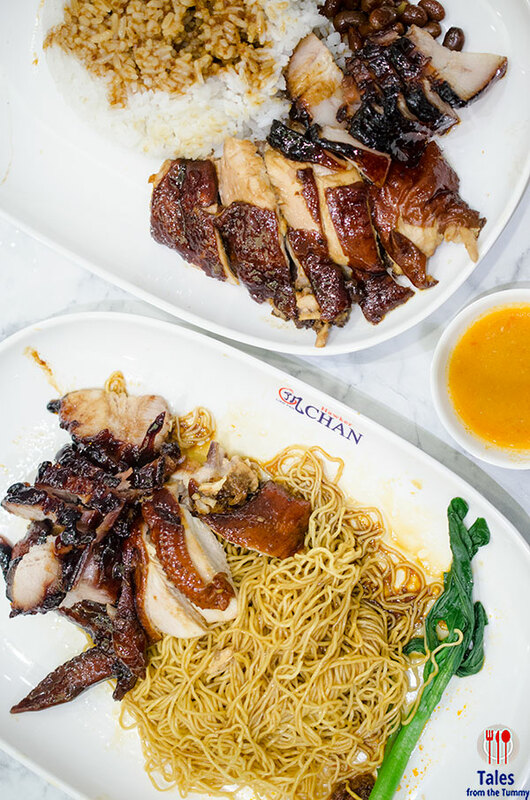 Hawker Chan, the celebrated Singaporean hawker stall who garnered a Michelin Star in 2016, is opening their first outlet in the Philippines. 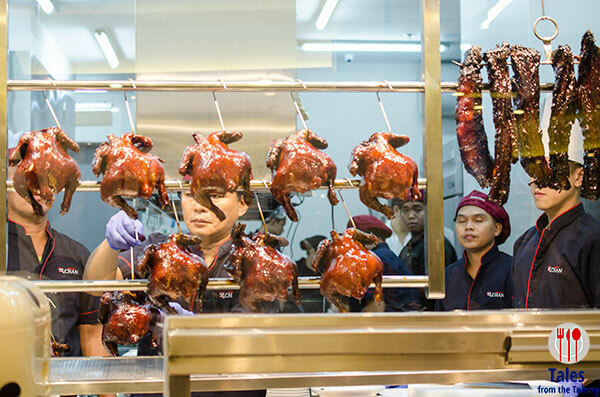 The world’s cheapest Michelin-starred restaurant in the world will be opening on July 26 at the G/F entertainment Mall, Mall of Asia. The local franchise was brought in by the Foodee Global group, continuing their goal of giving local diners affordable luxury with prices ranging from P128 to P198 only. Hawker Chan will not be fancy but will instead add modern comforts to the hawker stall feel. Seating and decor are fairly simple but with much needed air conditioning. They will have a simple menu based around their famous HK style soya chicken, roast pork, charsiu (barbecued pork) and pork rib. I was only able to try two of the items so will have to visit again in the future. For starters I recommend getting the Thai Style Tofu. 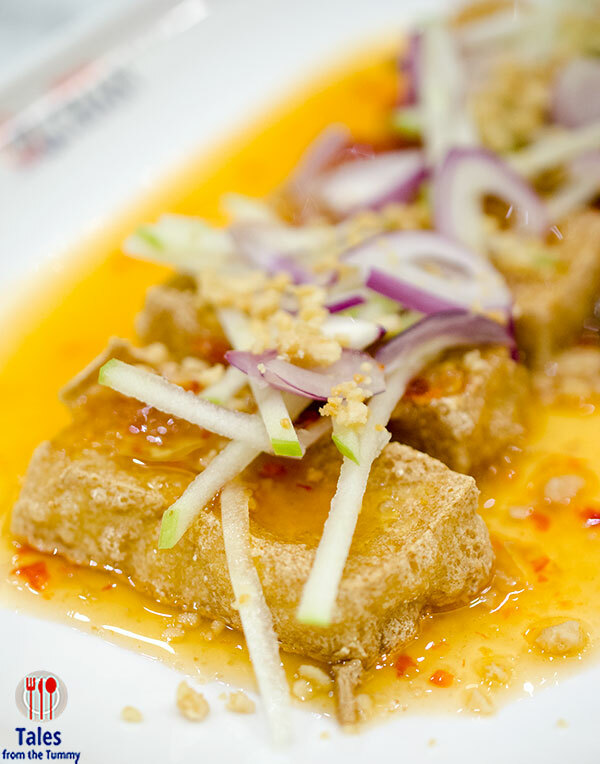 The tofu pieces are perfectly fried with a satisfying crisp with no hint of oil. The sweet and spicy sauce it lays in is complemented by crushed peanuts, red onions and refreshing julienned green apples for a fresh crunch. All of their roasted meats can be enjoyed with rice, springy “QQ” noodles or hofun noodles. I highly recommend the springy noodles with the meat of your choice. They serve it with two condiments, pickled chili and home made chili sauce. 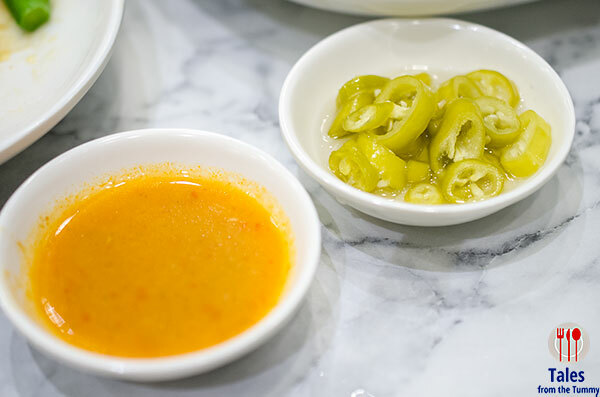 It’s the chili sauce that is the standout, partly tangy and party spicy, it helps cut thru the sweetness and oiliness of the dishes at Hawker Chan. 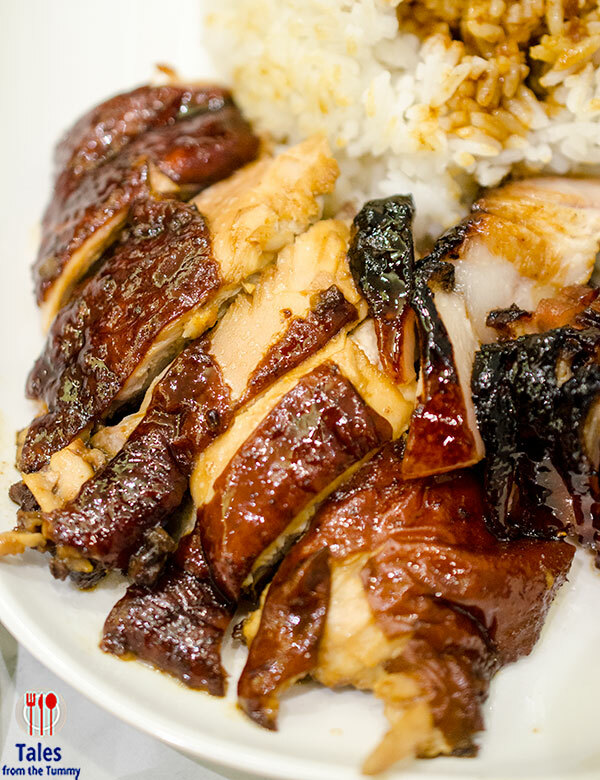 The soya chicken is noticeable darker than the usual HK style preparation. It’s marinated in Chef Chan Hong Meng‘s proprietary lo sou that is never thrown away but instead is added upon daily to enhance the flavor. I’ve tried both white and dark meats and both go really well with the chili sauce but the best parts are the skin which are packed with the signature salty sweet flavors. 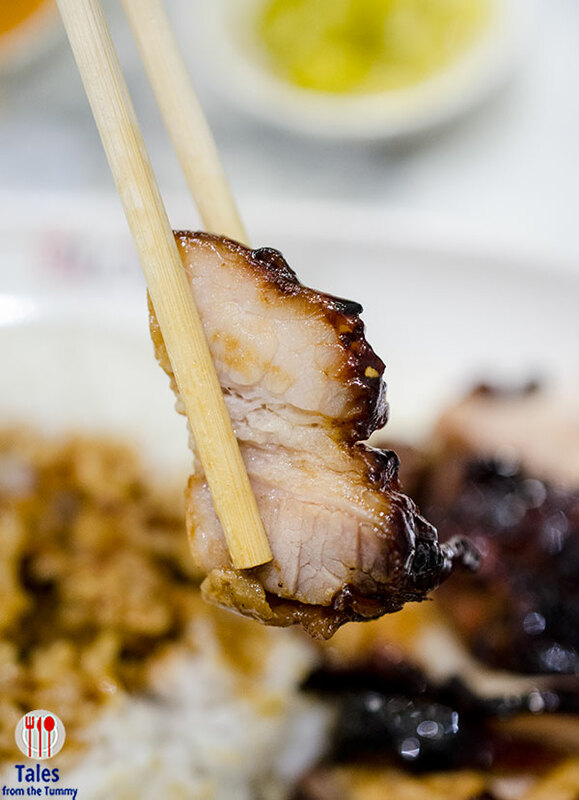 The char siu at Hawker Chan was really good, they cut it thinly. Each piece of has excellent charring that is rich and smoky. 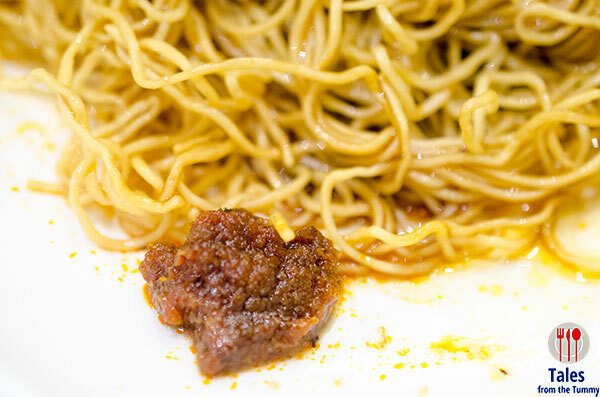 The noodles are springy with a good qq chew and is served with sambal belachan. I suggest mixing in half of the sambal first into the dark soy noodles but we found less spicy than expected. 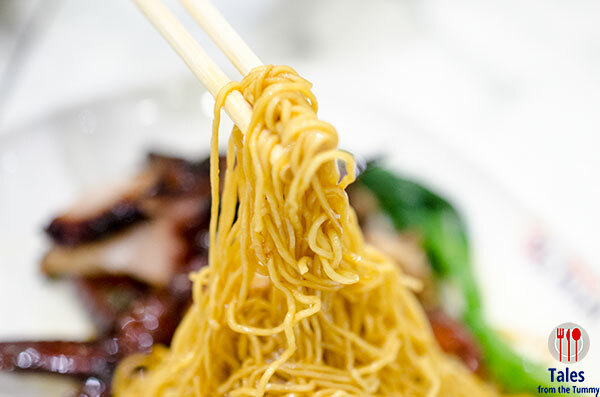 The noodles are extremely flavorful, eating it with the charsiu reminded us of the wantan mee we had in Penang, Malaysia. Lauren loved the wantan mee and we can’t wait to bring her to Hawker Chan to try that out. Irene and I also will be going back to try the pork ribs and roasted pork. Do you find Mall of Asia to be a bit far, don’t worry they will be opening a branch in SM North EDSA after 60 days then 3 more branches around the metro.